The SAP HANA dynamic tiering option is a native big data solution for SAP HANA. The dynamic tiering option adds smart, disk-based extended storage to your SAP HANA database. Dynamic tiering enhances SAP HANA with large volume, warm data management capability. The dynamic tiering option adds the extended storage service to your SAP HANA system. You use the extended storage service to create the extended storage store and extended tables. Extended tables behave like all other HANA tables, but their data resides in the disk-based extended storage store. Your application automatically determines which tier to save data to: the SAP HANA in-memory store (the hot store), or extended storage (the warm store). When you use dynamic tiering to place hot data in SAP HANA in-memory tables, and warm data in extended tables, highest value data remains in memory, and cooler less-valuable data is saved to the extended store. This can reduce the size of your in-memory database. 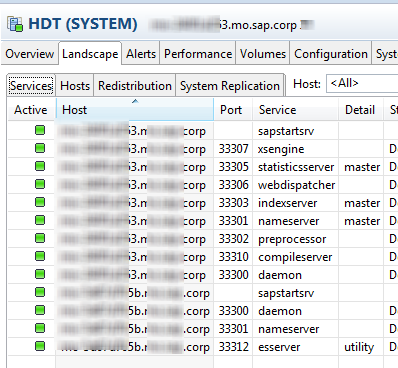 Dynamic Tiering feature [SAP HANA Extended Storage feature] is supported in since HANA SP09. This blog is about My Experience on Dynamic Tiering Setup. This blog will helpful for you to make the Dynamic Tiering setup in your landscape. I have two Linux Hosts [I named as LinuxHost1, LinuxHost2] with same configuration and same root user and password. HANA Server will be installed on LinuxHost1 and ES Server will be installed on LinuxHost2. Both the components cannot be installed on same Linux machine. The following file systems in the two Linux hosts should have shared persistence. The following Parameters, especially we have to mention for Dynamic Tiering Setup. We have to mention the details of LinuxHost2 and its role. 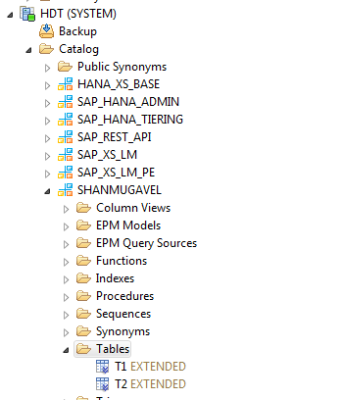 we have to mention location of HANA DB server Installation File package and HANA Option (Dynamic Tiering) Installation File package. The format is Component_dirs = <HANA_Installation_Path>, <HANA_Option_Installation_path> comma separates both the installation packages. Then we have to mention all other required parameters in the batch file (cfg file) like SID, Instance Number, DB_Mode (Single Container), sapadm password, system administrator (<SID>adm) password, system_user_password, user_id, group_id, sapmnt path, data path and log path. Once Configuration file is ready, we have to start Installation using hdblcm with configuration file. During Installation Process, To be Installed Components will be listed. Select the option all, which will install HANA Server in LinuxHost1 and Dynamic Tiering setup [ES Server] in LinuxHost2. LinuxHost2 will become additional host and will act as Extended Storage Server. Once Installation Process Completed, HANA Server is installed in LinuxHost1 and Dynamic Tiering setup [ES Server] is installed in LinuxHost2. 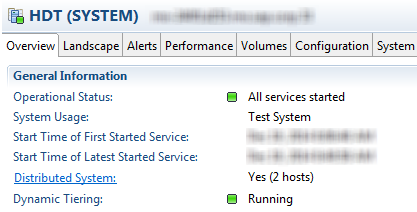 Once Installation Completed Successfully, I am going to check the running process in two Hosts. Name server, preprocessor, compile server, index server, statistics server, xs engine are running in Linux server1. Name server and ES server are running in Linux server 2. I am Connecting HDT System from the Studio. It will display list of servers from Both the Hosts. After Installation completed, If we check the system, We can see the Information that Dynamic Tiering is Installed But not running. Co-ordinater Type for esserver is NONE. So Dynamic Tiering is Installed But not running. How can we make Dynamic Tiering is running? To make Dynamic Tiering is running, we have to create Extended Storage in LinuxHost2. Execute the following SQL Query in HDT System. We have to use <EXTENED STORAGE> Clause in SQL Query to create Extended Storage Table. Extended Storage Table T2 is created. I am checking Data Preview from Extended Storage Table.